Johnsen Trailer Sales, Inc.: Trailer Sales & Service in North Dakota and also serving Minnesota, Montana & surrounding areas! The trucking industry is at the core of commerce in our country, and we have been serving this bedrock industry for a very long time. Johnsen Trailer Sales, Inc. was founded in 1959 in Bismarck, North Dakota, when things were a lot different than they are today. We have been selling, servicing and maintaining semi-trailers in the region since then, and our capabilities have evolved along with the industry. Our company is still family owned and operated, so we take a great deal of pride in the work that we do, because our name is stamped on it. 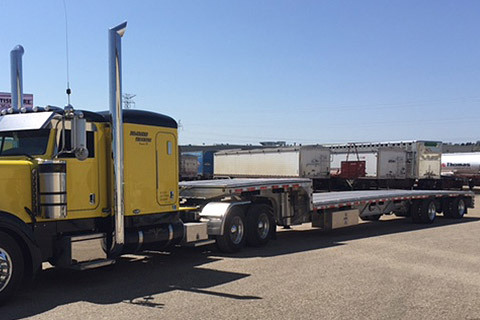 We have been able to stay in the semi-trailer sales and service business for this long because we have built a solid reputation throughout the states that we serve. We are based in North Dakota, with locations in Fargo and Bismarck. However, we also serve customers in Wyoming, Montana, South Dakota, Minnesota, and parts of Canada. That’s a pretty broad area, so feel free to get in touch. Our reach is considerable because of the wide demand for the equipment and services that we provide. Over the years, we have identified the leading semi-trailer manufacturers in the industry. We are factory authorized dealers for Wilson, Hyundai, Talbert, Manac and Muv-All Low Boy. These are names that resonate loudly within the trucking industry, and our long-standing relationships enable us to negotiate the most competitive prices. As a result, we are in a position to pass the savings along to our customers. In addition to our semi-trailer sales capabilities, our top-notch mechanics are always standing by to provide preventative maintenance and repairs, and we are equipped to respond to emergency situations. We also stock a wide variety of semi-trailer parts, so if you need it, we most likely have it. Time is money in any business, but this is especially true when you are in the trucking industry. When you develop a relationship with Johnsen Trailer Sales, everything that you need is right at your fingertips. To make the connection, call us at (800) 472-2649 in Bismarck or (800) 246-3790 in Fargo, or use our form to contact us and a member of our team will answer your questions and recommend the right solutions. Areas Served: North Dakota and surrounding states of Montana, Minnesota, South Dakota PLUS Canada.